This issue’s article is by Punkajj Dhar who graduated from IIT Kanpur in communications. He has over a decade of experience in embedded systems (systems software) and Telecommunications (worked for CISCO systems and Motorola USA). He is a Vedic mathematics enthusiast and believes it can make a paradigm shift :) from rigid logic to a more fluid logic :). I love Vedic Maths and I teach Vedic Mathematics as outlined in the Teacher's Manuals by Prof. Williams using the languages: English, French and Arabic. I have created an audio version of 'Pebble Maths' to accommodate the needs of the many Dyslexic people who are now studying Pebble Maths in order to overcome dyscalculia. These people can use the book and the recording simultaneously . I am also filming a teacher training programme, 10 lessons approximately 90 minutes each. These videos are available from the website. My new series 'Stairway to Heaven' follows on from Pebble Maths . It is suitable for young high school children as a visual and hands on pathway to the understanding of the available texts. The first book which is called 'Step One' begins with the creation of squares, revealing the patterning inherent in the differences , digit sums and algebraic formulae. The students become adept in mental squaring , using many methods some of which they derive themselves, in the process of charting the numbers. They discover Duplex methods as well as working with Vertically and Crosswise. The students gain a deep working knowledge of place value which is essential for creating the coefficients of the algebraic formulae. They can 'see' the root of any perfect square . By creating the algebraic formulae from the arithmetic the students understand the connection between the arithmetic and algebra. This introduction to solving polynomial expressions is simple and natural. Step two is in the process of being written at the moment. I move to cubic numbers, creating mental methods of calculation, differences between cubes, comparison to squares, creating algebraic expressions and therefore predicting the coefficients. The 'Heavenly' component will hopefully be realized by the end of the five books by which stage the students will be able to not only study and understanding the Vedic texts which are available, but will also be able to go beyond and create more. I feel it is important for students to see that all aspects of mathematics; arithmetic, algebra , geometry , trigonometry and calculus are inter- related. The 'Stairway ' series shows how one branch of mathematics arises from the study of another, arithmetic being the foundation on which it all rests. The students who have studied Pebble Maths find this work easy and enjoyable as they have a rock solid (pardon the pun) foundation in the four operations with a Vedic lean on all the processes. The inspiration for this series is Kenneth Williams latest publication 'The Crowning Gem' which filled me with awe. My desire is that my students can reach this level of mathematics with ease. Arvind will be following up with further courses. We now have 64 tutors, in 16 different countries. The next (7th) VMTTC starts 16th August 2014. The 3rd Certificate course has just ended. The next one starts on 19th July 2014. The 2nd Diploma course is underway. Our 2nd Advanced Diploma Course has just ended. The next one starts on 1st November 2014. A course on Powers, Roots and Polynomial Equations is currently in progress with selected participants and will be made generally available later. The interactive tutorials at http://tutorials.vedicmaths.org/ are very suitable for schools and anyone wanting to increase their calculating speed, as they construct random questions. So you don’t get the same questions repeated every time you practice. 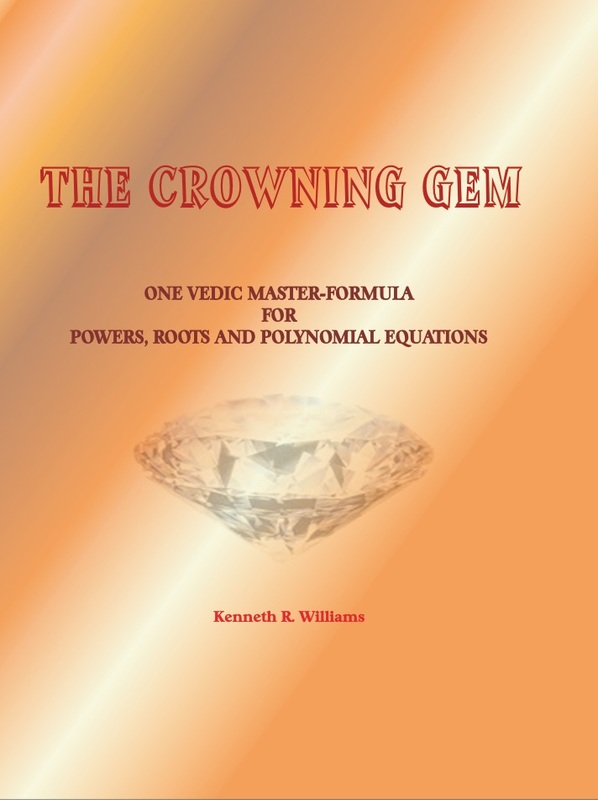 It has been a matter of great pleasure and pride for me to be a student of Vedic Mathematics (VM) and at the same a humble student of Sri Ken Williams. Who has been guiding my journey all over the VM. Now let me ask you a question, do you use Google search or Facebook or linked in? I am sure you do , the good news is VM could be applied to improve upon speed of responses of all these further. VM enables a lot of work to be done at a level which makes things much faster. Also if we look at world around - all that has come up like air-conditioner or fan in your office, buildings, cars, internet etc., all use mathematics. The base of all this as you know is engineering mathematics. If this mathematics were not there - this gadget would not have been there. Simple. Now electrical engineers use Laplace Transform or differential equations to solve problems to do with circuits or control systems, all this can be tackled much faster by use of VM. The music that you hear of your favorite singer or the movie you watch - before it reaches your ears , may have a lot of mathematics from Fourier analysis applied on it - once again VM provides powerful alternate insights to do things faster and also understand and master the relevant mathematics, more easily. While Flying in an aircraft (travelling) – don’t forget complex analysis  - used to design wings and also may be model wind flows, all this is also better tackled by VM (better tackled means = faster to do computations and easier to understand by the mathematician/engineer) . The credit goes to untiring work done by Sri Williams (his great and inspiring books), which have provided the bridge of Vedic mathematics from Swami ji to the present state of the art. It enables us to be able to effectively look at most of the engineering problems from a VM perspective as well apart from the Modern maths (MM) one. This indeed is a great leap for VM!!! Now the roads are open for more exploration. A food for thought for all of us (courtesy Sri Williams) - we have trigonometry,3d geometry, complex analysis, vectors, coordinate geometry - all targeted to look at properties of 3d space! Why so much of cluttering? NO one has asked this question. VM approach sort of integrates our views to look at these different areas in a unified manner. It is the unification (synthesis) as Sri Williams suggested to me that makes the difference between VM and MM. Also one could apply lot of ideas of limits, Pythagoras theorem within VM and extend them for n-dimensions (ekadhika ;) rule) and see how beautifully VM helps us look at things from a different perspective. VM helps the mind to go to the roots of problem and also solve it flexibly - so helping us in other areas as well, like management, physics etc. It Helps in building alternative solutions to a given problem. Last but not the least - It’s all hands on, the proof of pudding is in eating it . Simple! The speed of execution/computation of VM and the ease to learn it can be demonstrated experimentally for any specific area in engineering long with two groups of people one looking at the area by use of MM and one doing VM – I am sort of convinced that All this can be empirically established, so nothing in thin air . All real and doable!! !